The obvious reason for a mirror is to check your own reflection, of course. But while you most certainly have mirrors in each of your bathrooms, and perhaps your bedroom too—you may not have thought to put a mirror in an entryway, mudroom or hallway! In these spaces, they're perfect for last-minute checks of your appearance before heading out the door. 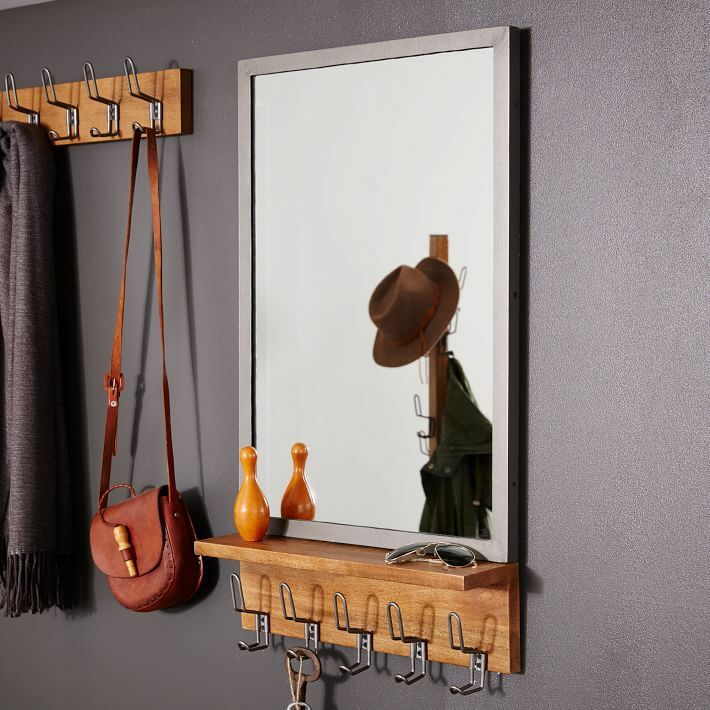 You'll be surprised how much you use and appreciate a mirror when placed, as this one is, near a set of hooks, a shelf or console where you can stash other items you may need to freshen up. Or, so you can easily grab your necessities on your way out the door. This stylish idea has a convenience factor that's hard to beat, and luckily it's easy to find mirrors that are beautiful enough for even the grandest of entries. Here's one of our ultimate mirror no-no's when it comes to design: Try not to place your mirrors on walls that reflect other walls, or your TV setup, or even worse, just the ceiling (what?!). It really doesn't do much for your space. Instead, opt for art on these walls (and don't angle anything towards the ceiling) and place your mirror where it can catch the light from a window or the rest of a nice, open room, instead. Dark rooms, or dens without windows, would especially benefit from a mirror. They help bounce natural light around the room, even if it's coming from a lamp or a ceiling light. For extra sparkle at night, consider placing candles or lamps in front of a mirror that hangs above a console table or buffet for a truly glowy atmosphere. Just as mirrors can give the illusion of more light, they can also make a room feel larger than it really is, which is great when you're living in a small home or apartment. When hung low or when propped against a wall, large mirrors in particular give the illusion of more space. The sense of depth that mirrors lend to small spaces may be worth the higher price. And, if you're looking for further advice, Home Made Modern has a great trick for turning lots of smaller, inexpensive mirrors into a larger installation. As we've discussed so far, mirrors can serve a lot of important purposes beyond just looking pretty and helping make sure you look good, too. (But you know you look great already, right?) They are also useful accessories to choose for small or dark spaces because they give the illusion of more space and light—both of which are also good things. In addition to these practical purposes, the sheer variety of mirror styles, colors and shapes available these days make it fun to choose one for your space. Sometimes, you don't need a mirror, you want one... Just because! Maybe, it would make a great accent in your room, or you found it at a flea market and couldn't say no, or the color of the frame just spoke to you. A driftwood mirror is perfect for a coastal space, while no mid-century modern home would be complete without a starburst mirror. Mirrors can have rustic wood finishes, mosaic tile borders, lacquered baroque frames, gilded leaves, leather with nailhead trim, and even fur or cowhide frames. If you're the DIY type, there are a lot of ways you can be clever and make your mirror (or mirrors) uniquely yours—or inspired by much more expensive in-store finds. Below, check out these clever ways to make mirrors that are spot-on lookalikes to more expensive ones you can buy from upscale retailers.